Friday is the deadline for observations on the proposed greenway from Baldoyle to Portmarnock. Observations should be made to An Bord Pleanála in relation to application 300840. My submission strongly supports the route which has been one of my main goals as a Councillor. The changes I propose to the application are that a) the lighting needs to be minimal to protect both the wildlife and the landscape and b) the path structure and surface need to be designed and built to a high standard. This entry was posted in Baldoyle / Baile Dubh Ghaill, Portmarnock/Port Mearnóg, Transport / Taisteal, Walking & Cycling / Siúil & Rothaíocht on March 21, 2018 by david. 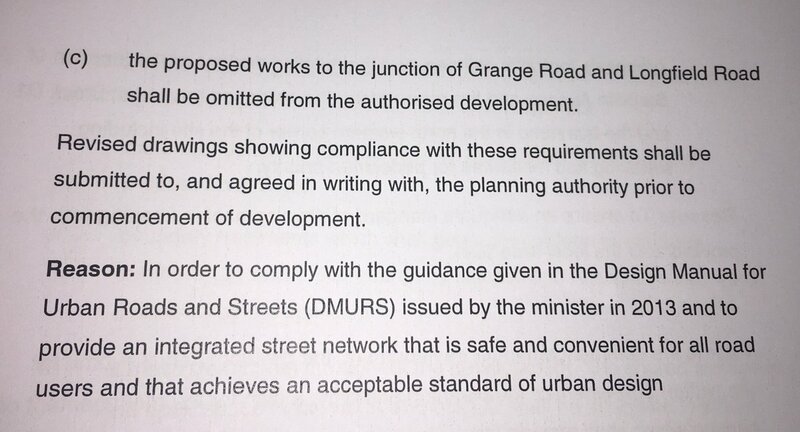 In response to my observation, An Bord Pleanála has deleted the Grange Road junction redesign from the planning permission. I have included the issue of redesigning the junction for the safety of cyclists and pedestrians on the agenda of the January area committee meeting. This entry was posted in Baldoyle / Baile Dubh Ghaill, Transport / Taisteal, Walking & Cycling / Siúil & Rothaíocht on December 13, 2017 by david. There is considerable interest in the area in both freshwater and coastal water. It should be possible to get good public engagement in the RBMP actions in the area. I welcome the inclusion of the Mayne and Santry rivers. They cover a signficant area and significant population; it should be possible to get considerable public involvement in relation to them. Given the extent of development planned in the Mayne catchment, an objective of ensuring that the development does not lead to a degradation in the status of the river and engagement accordingly with planning and building control could make a significant difference. I mentioned the Northside Partnership who have developed a proposal for a Greenway along the Santry River. They may be interested in cooperating on the River itself as well. I suggest that it makes sense to also include the streams in Howth. (Full list at https://en.wikipedia.org/wiki/List_of_rivers_of_County_Dublin but of greatest importance are Balsaggart Stream, Whitewater Brook, Gray’s Brook, Offington Stream and (because it discharges onto Claremont Beach) the Bloody Stream) The Howth streams are all part of the Special Amenity Area and the Management Committee for that Area would be in a position to participate in and assist the measures to be taken to achieve good status for them. It also makes sense to include the coastal waters between where the Santry meets Dublin Bay and Baldoyle Estuary. These Mayne and Santry rivers are both included in the catchment of the Dublin Bay Biosphere Reserve; as the Dublin Bay analysis is looking upstream, it makes sense for the RBMP analysis to also look downstream. This entry was posted in Baldoyle / Baile Dubh Ghaill, Biodiversity / Bithéagsúlacht, Clonshaugh / Cluain Seach + Belcamp, Portmarnock/Port Mearnóg, Water / Uisce on November 2, 2017 by david.